I almost didn’t read this one. Right there on the cover, emblazoned in a starburst, the blurb proclaiming Suarez to be a natural successor to Michael Chrichton. So this is going to be airport fiction by a man whose mind has been warped by climate change denialism? No thanks. Fortunately reviews elsewhere convinced me to give it a chance. And while it may well fall into the ‘holiday read’ category it’s nonetheless a thought-provoking and knowledgeable read. Influx kicks off in an unassuming research lab being visited by representatives of a concerned group of venture capitalists. It seems Jon Grady and his team have been lax in producing the promised results and their funders are concerned. However their concern is far from warranted. Using their original research as a cover, the assembled crew of scientists have managed to unlock the keys to one of nature’s most fundamental forces, creating a ‘gravity mirror’ with unlimited applications. This is the kind of revolutionary science (explained in brain-smashing detail) which only happens once in a lifetime and changes everything forever afterwards. Grady has been targeted by the Bureau of Technology Control, a government department charged with the control and removal of technologies with the power to upset the delicate balance of society. The BTC lives in almost a parallel universe, a hidden world of fusion power and artificial intelligence, faking the deaths of the most creative and cutting-edge scientists, shelving their creations until a suitable and tasking them with further research with virtually unlimited resources. Their remit is ostensibly for the good of mankind but Grady resists, refusing to cooperate with what he sees as an immoral obstacle to human progress. This, it turns out, is a very bad move indeed. The BTC are a more powerful and wide-reaching enemy than he could ever have imagined. 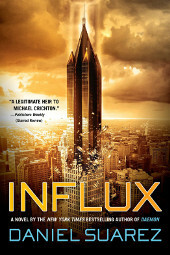 Influx aims to get its hooks into the current conspiratorial, anti-science zeitgeist and very much succeeds. The BTC and its director, the sinister Hendrick, are straight out of a Conspiracy Theory 101 course. In fact I sincerely wonder how many people are going to read this book and say “I told you so! I knew they were out there!”. One could level the charge of picking easy targets at Suarez as after all this is just an extension of the tinfoil hat crew’s alarm call of “If there are so many scientists working on cancer, why isn’t there a cure? They’re keeping it from us and feeding us poison instead!” However Suarez picks up their mixture of ignorance, credulity and general stupidity and proceeds to throw it all into an action-movie blender. The result is a very readable thriller with the perfect balance of plausible science and brainless action to attract a pretty wide audience. Part of the fun is the sheer level of imagination involved. From the background and complexity of the BTC itself to their fiendish prison, Hibernity, Influx keeps throwing idea after idea at you, but never to the point where you start drowning in them. And the toys, oh my god the toys. We’ve got hover belts, heat rays, even neurological sleep guns. And how much do I want a chain golem? One first picking up the book I was worried that it was going to stray into Crichton’s recent anti-scientific realms but fortunately Suarez seems to be on the side of sanity. For him the scientists are the heroes and it’s over-reaching government – with the BTC being specifically NSA-like in many of its actions – which are the target of his ire. It’s far from intellectually challenging although it’ll make you stop and think now and again. And the plotholes are too numerous to get into here. But in the end it’s an enjoyably silly read for anyone with even a passing interest in technology and the pace of human progress.